Looking for a way to generate excitement in your neighborhood families about Messy Church? 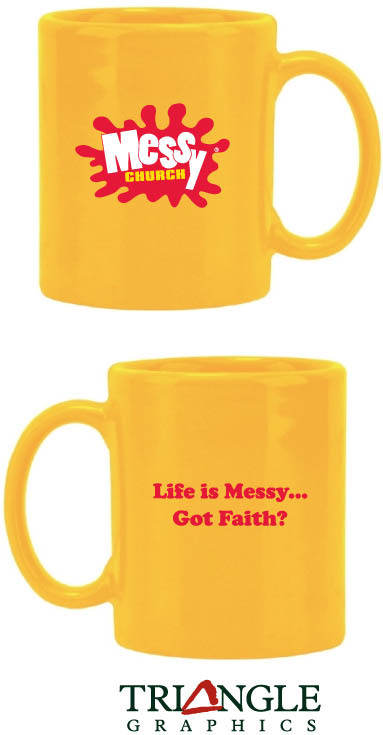 Many Messy Churches around the world have found that Messy Church logo products like T shirts, aprons, sweat shirts, coffee mugs, and banners help to get the word out. Messy Church USA has developed an exclusive relationship with Triangle Graphics in Eugene, Oregon to provide you with a selection of logo products at an affordable price. Below are some of the sample products and contact information to place your order. Prices per item are lower when larger quantities are ordered. Call Triangle Graphics and they can help you get the best price possible.